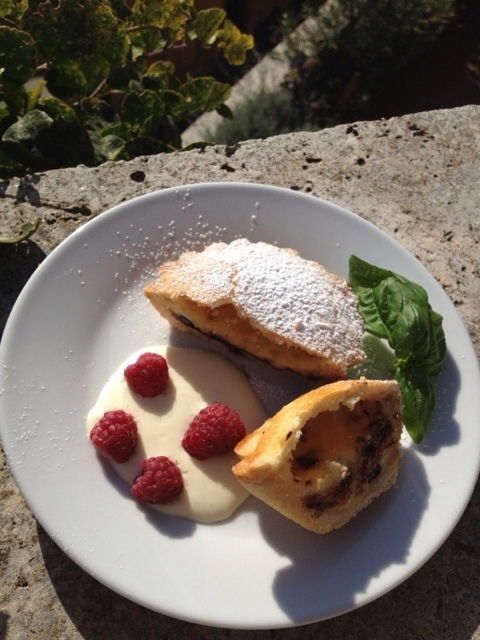 Puglia is the stiletto heel of Italy and its cuisine relies heavy on its proximity to the sea and its fertile land. 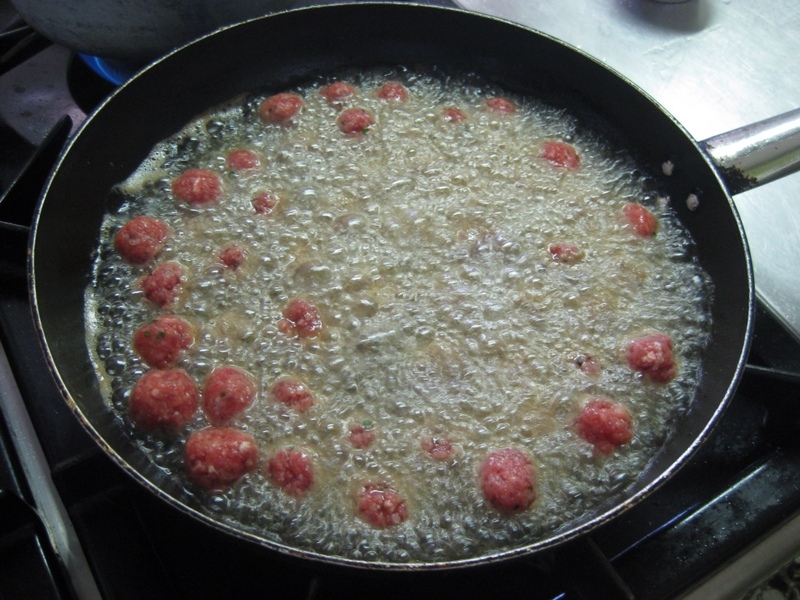 Tradition has it that the salty food is literally flavored by the sea, using seawater to boil pasta and vegetables and salt from the ocean to preserve fish, like the dried and rehydrated baccala we used in class. We started our journey south with a twist on traditional pizza – using mashed potatoes in the dough to make pizza tarantina. 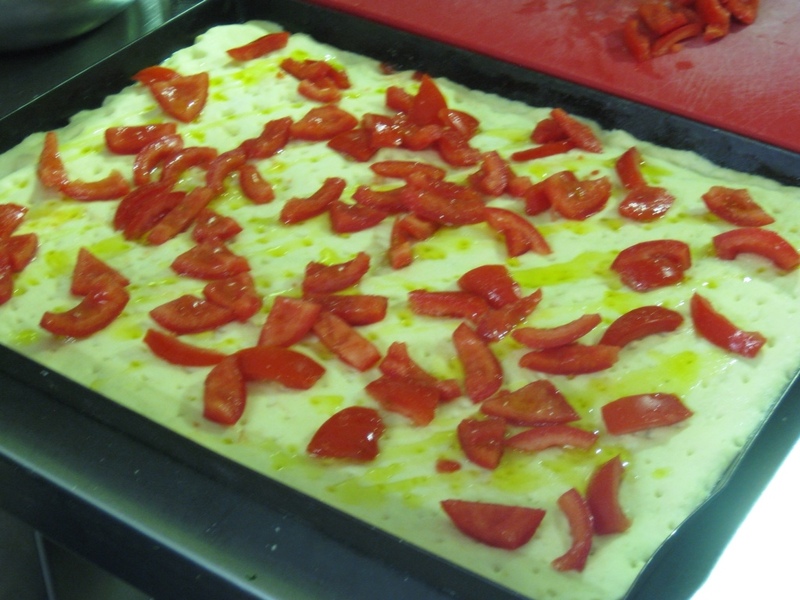 We made the dense dough much in the same way we make focaccia, spreading it out on a pan with oil and placing the toppings – this time tomato slices and oregano – on top. We baked it almost completely, took it out of the oven to cut into serving-sized pieces, then put a piece of mozzarella on each slice, and then returned it to the oven. 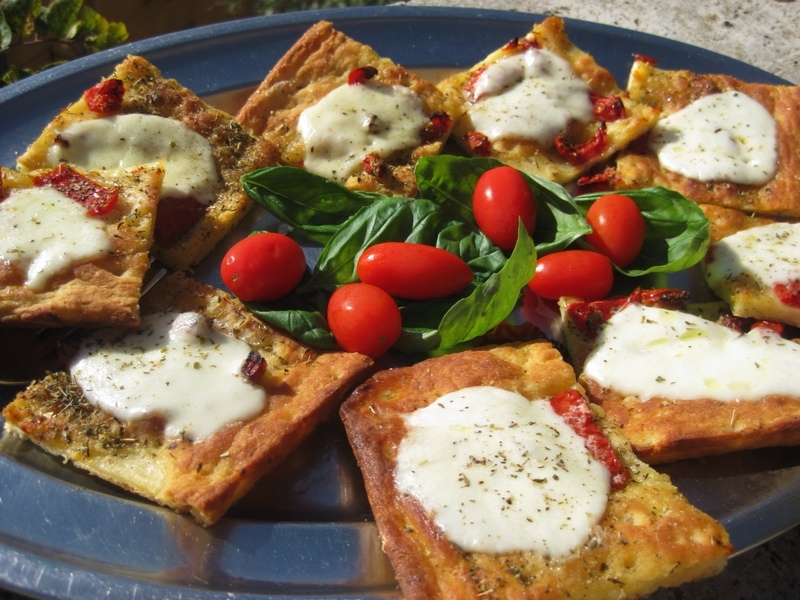 The result was delicious – soft, chewy, starchy dough with fresh toppings. 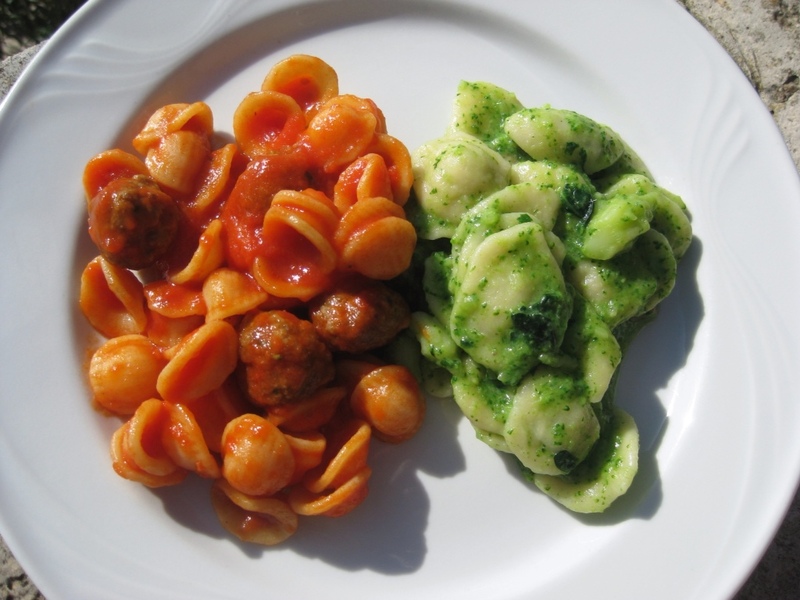 The primo piatto was orecchiette al broccoli, the traditional “little ears” of pasta made with a broccoli sauce. 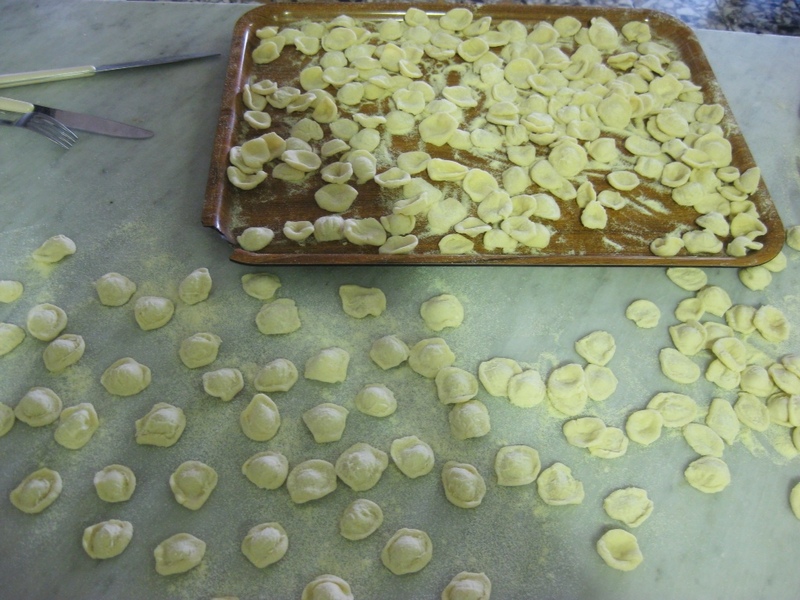 Orecchiette are notoriously time consuming to make if you don't know what you're doing (Exhibit A: Me) but I've heard that the women in Puglia are able to make kilos at lightning speed. 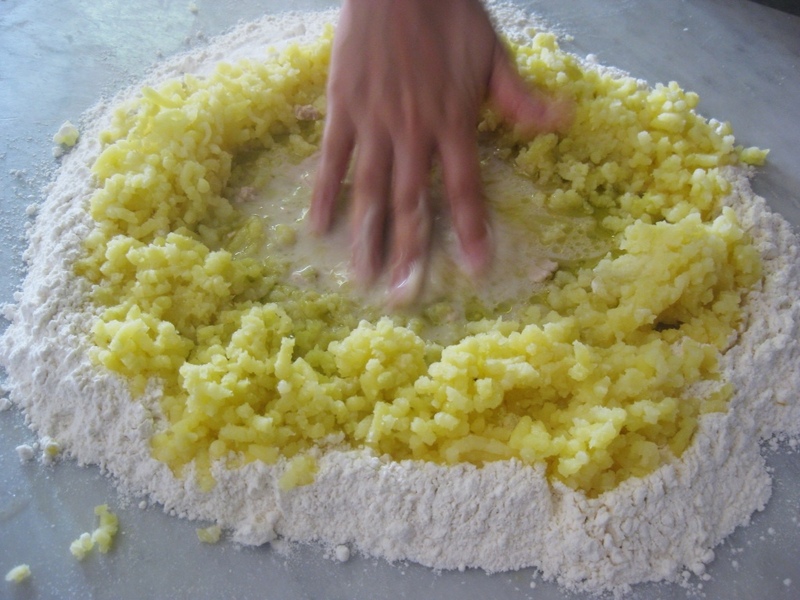 You make the dough with a harder flour than for other pastas and only use water and salt to make it, unlike most of the pastas we've made which include eggs and a little oil. 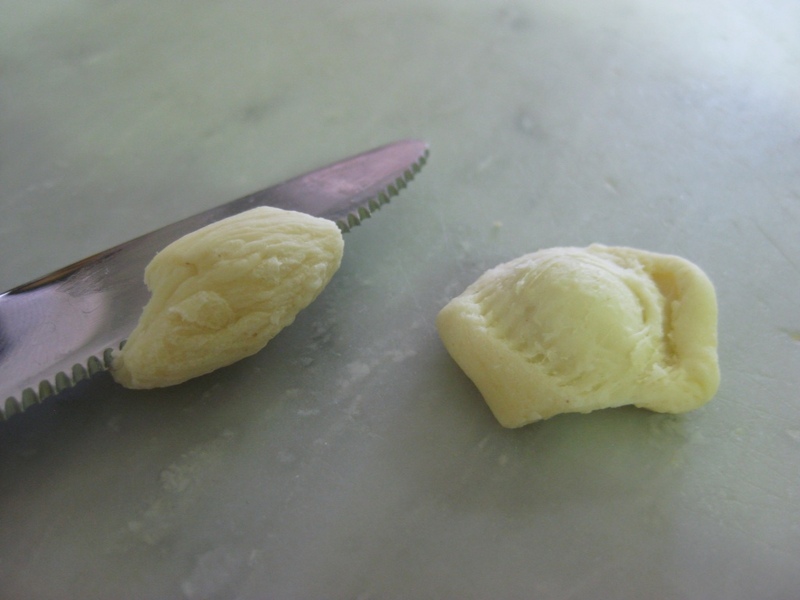 You roll the dense dough into logs, cut them into thumbnail sized slices, and then drag a knife across the dough to make a little cap, which you then turn upside down and presto, you have your orecchiette. Simple, right? I loved learning how to make the little pieces of pasta and started to get into a rhythm with it where my pasta began to resemble what they were meant to look like. 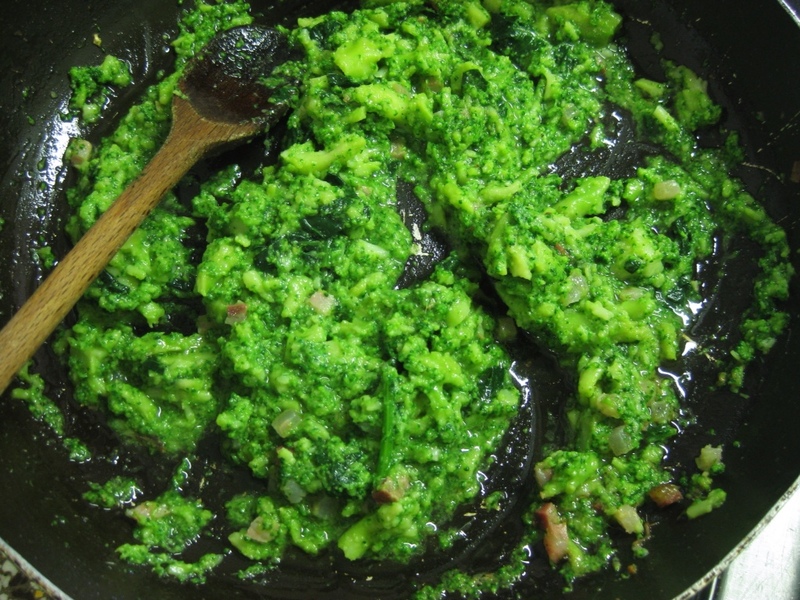 To make the broccoli sauce we sautéed garlic and a couple anchovies, then pancetta, then broccoli that we'd already boiled and then further mashed in the pan. Simple and vibrantly colored, it was the perfect match for the orecchiette, although I think we took the saltwater folk stories a bit too seriously in our seasoning. 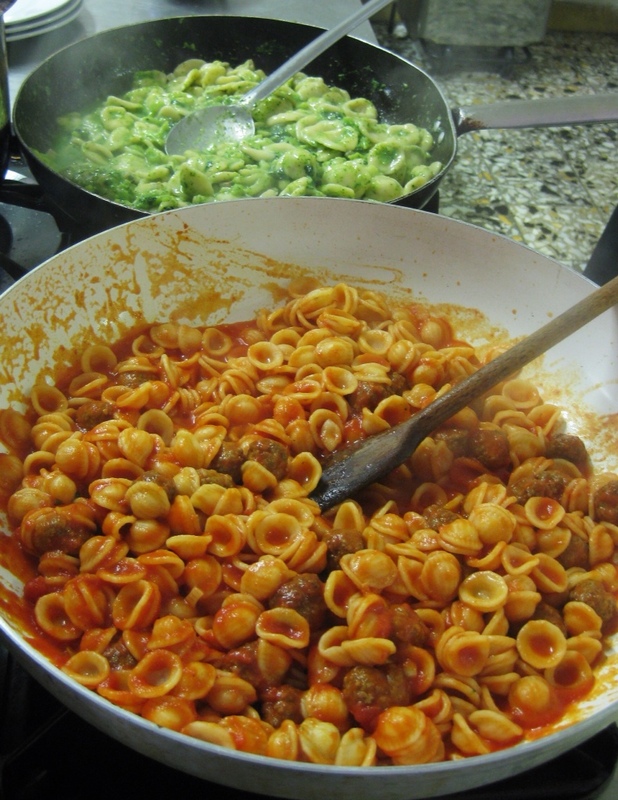 We also made a second batch of dried orecchiette with meatballs and red sauce – the closest thing I've seen to typical American-Italian dishes at home. 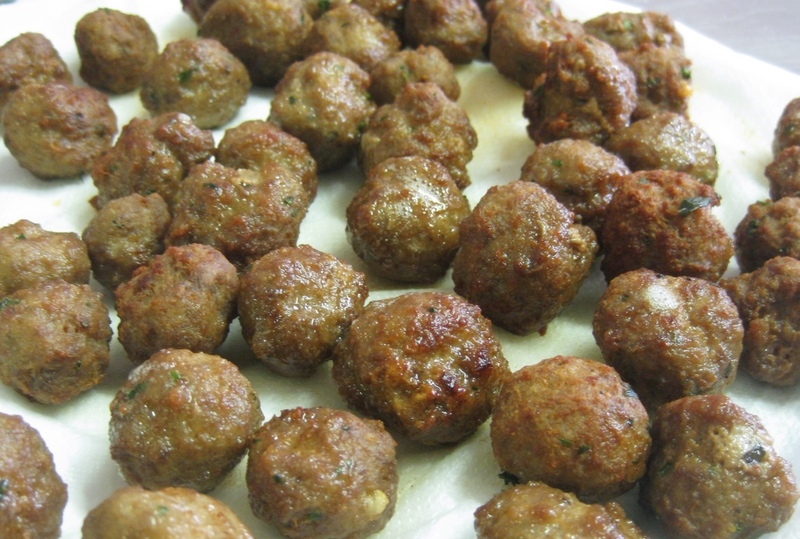 We mixed ground beef with parmesan, egg, and breadcrumbs to make the meatballs, fried them in sunflower oil, and then mixed them into a sauce of garlic and tomato puree. It was interesting to contrast the chewy texture and consistent shape of the commercial pasta with the softer, lighter handmade pasta, which relaxed its shape as it was cooked. 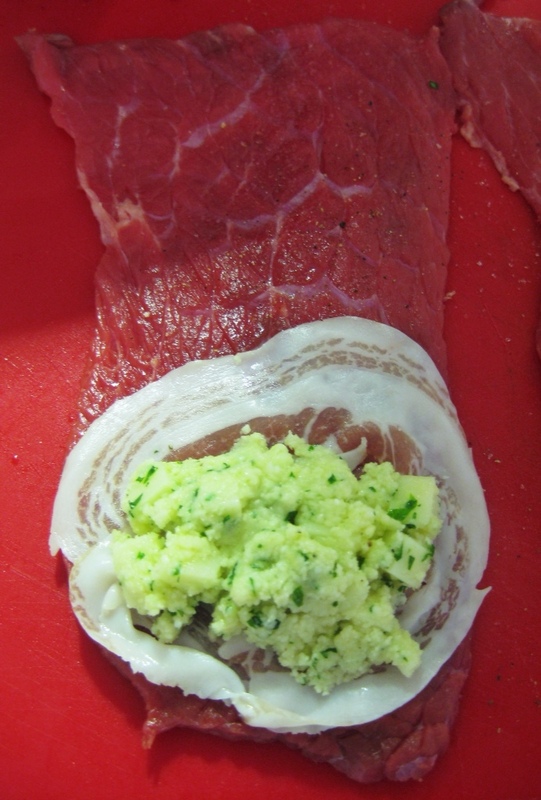 Our secondo was brasciole de manzo alla barese, or thin slices of beef wrapped with a filling of breadcrumbs, parsley, egg white, provolone, pecorino, garlic, and olive oil. 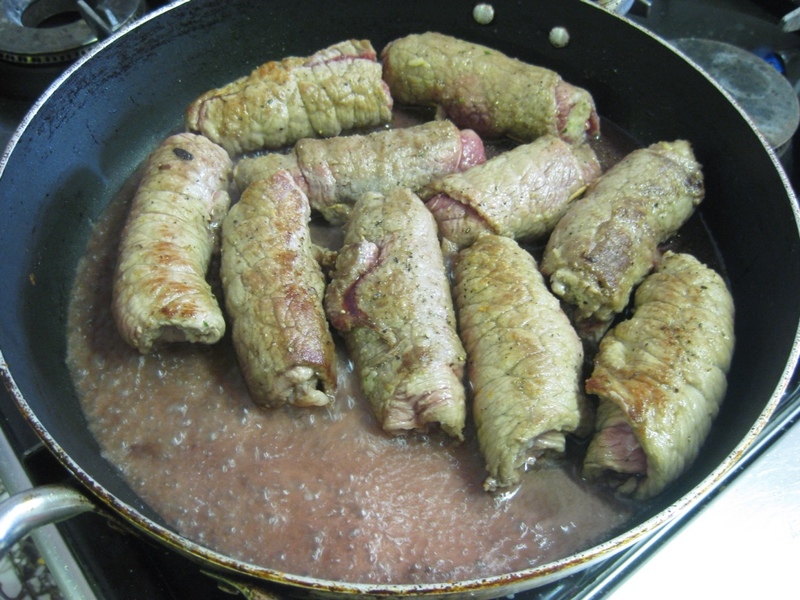 Like many dishes, we first sautéed the beef wraps in a pan and then transferred them to the oven before serving with a light sauce of garlic, fresh tomato, and parsley. 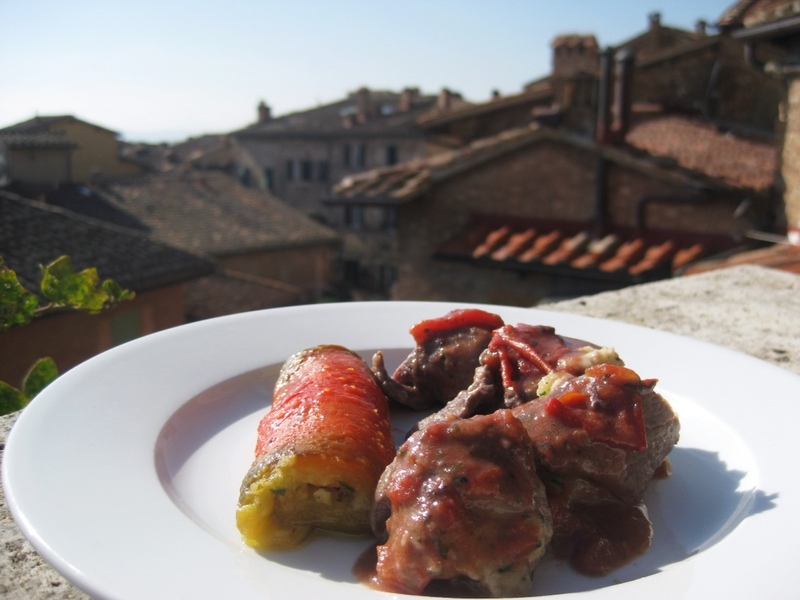 Our contorno was delicious – involtini di peperoni alla puliese or rolled fresh roasted peppers filled with pine nuts, raisins, capers, breadcrumbs, parsley, olive oil, and minced anchovy. 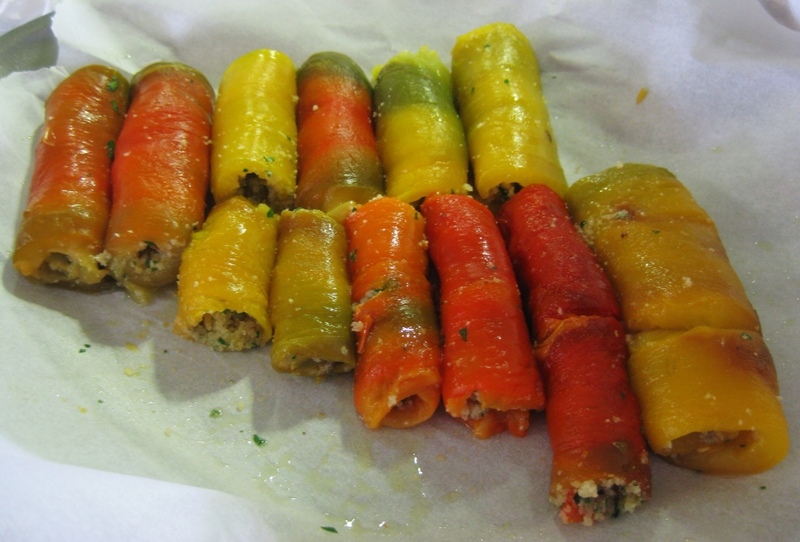 After roasting the multi-hued peppers in the oven, we peeled off the skin and cut them into rectangles, carefully rolling up the delicate flesh with the flavorful filling. 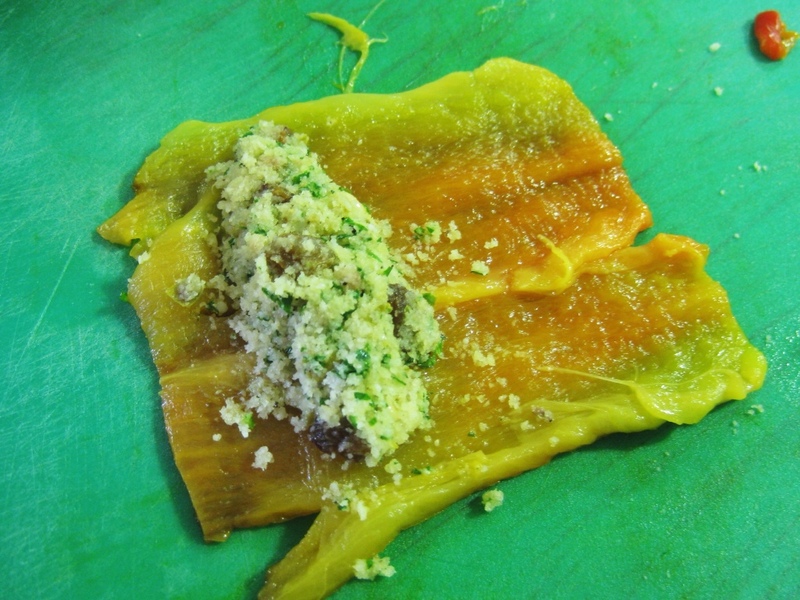 It was a beautiful dish and while time consuming to prepare, was not actually very difficult. 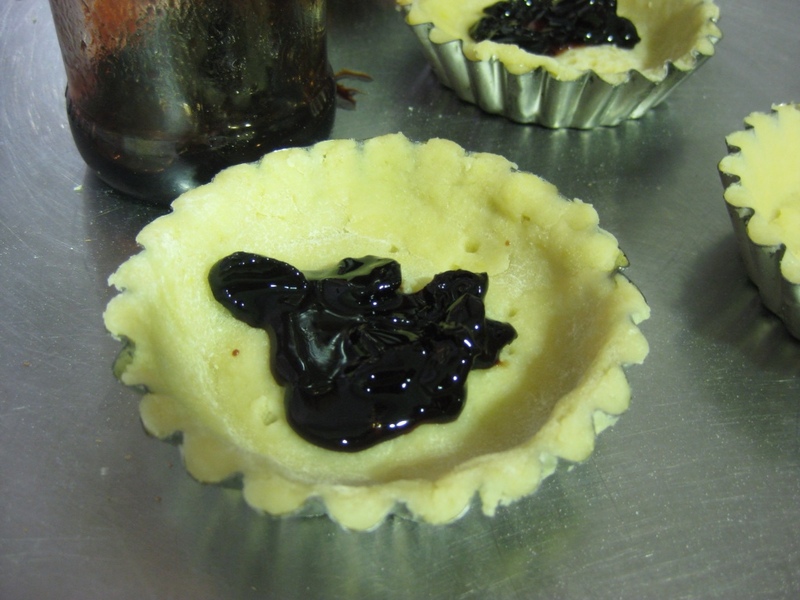 The dolce – pasticcio leccese – was another version of a custard filled tart, and we made some with the bitter cherries we had used a few days ago and others with chocolate chips. Definitely very good, but I'm starting to lose steam on the dessert front. If only we'd get to learn how to make gelato….. This entry was posted in Classes, Italian, Italy, Siena and tagged Italian. Bookmark the permalink.